Monday, January 21, 2019 Expand your territories, finish your quests, fight lots of battles, join a Guild and regain your lost memories. Make yourself the leader of a team filled with the most powerful heroes to lead your kingdom. Eternal Fury 2 is a new MMO ARPG for Android mobile that has official launched. With balanced PVP and PVE features, a robust weapon combination and a thrilling storyline with lots of side quests, Eternal Fury 2 promises to bring players an amazing experience in a classic turn-based MMORPG action. Game Hollywood announced their new free online mobile game Eternal Fury 2, which has caused a lot of expectation. 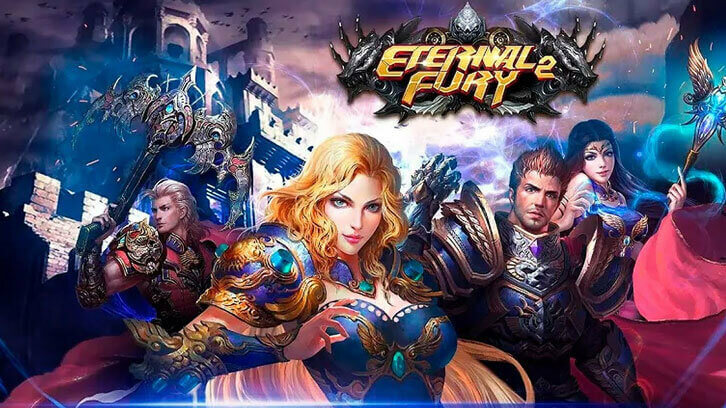 Eternal Fury was a favorite of millions of players, Eternal Fury 2 will deliver a better game experience, with a new gameplay but never forgetting what made Eternal Fury great. The game features 3D graphics, spectacular battle effects, upgradable units, turn-based RPG action and endless quests to enjoy. Players will take the role of a lost soul. He was attacked and injured, and now he can’t remember who he is and what’s his mission… but will still fight for justice until he regains his memory back and discovers the plot behind the havoc that has aroused in the kingdom. In this journey, players will not only live a fun experience improving their skills, but will also be accompanied by powerful mounts, servant, will be a part of a warriors’ Guild and can also find love. During its official launch, there will be welcome events and rewards both in game and on the official page. Players won’t want to miss this classic adventure!